REVOLUTION I and REVOLUTION II can be mounted using our U-T-B mounting system. The steering stabilizer is not built-in to the bar mounts. This allows the use of the stabilizer on multiple bikes. You can simply remove REVOLUTION I or II off one bike and attach it to the bar mounts on another. For those riders who require a forward and taller bar position or simply want the stabilizer tucked out of the way, UTB mounting can be extremely useful. Accommodates 1 1/8” handlebars only. 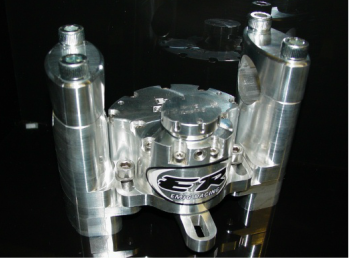 UTB mounting system is available for ER top triple clamp and select OEM top triple clamps only.